Double auriculas were amongst the first novelties grown by early Florists in the seventeenth century and are mentioned in books and depicted in paintings of the time. Some of the most prized doubles fetched a lot of money and were a valuable addition to a collection. Sadly they fell out of fashion when the show auriculas came into prominence and it was only in the second half of the twentieth century that interest was kindled again. 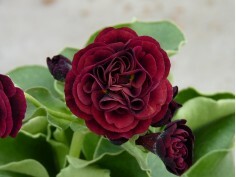 Thanks in part to Florence Bellis's work and other growers in America, the double auriculas were introduced back to England and there are now many amateur and professional growers producing some excellent doubles in a huge array of colours and forms. Here at Barnhaven, double auriculas are a staple part of our collection and we have been producing some very interesting results since Florence Bellis started working on them in the 1950s. 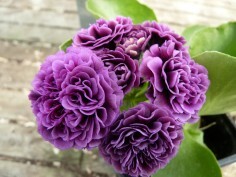 Easy to grow and often strongly scented. May need a little extra feeding to enable them to produce really good flowers.